In traditional fitness, choreography is constructed by changing steps and patterns frequently, presumably to hold students’ interest or challenge them. 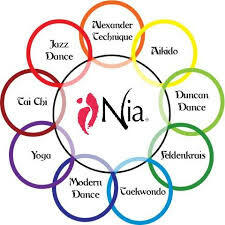 In Nia, we use the energy of the [nine different] movement forms [from the dance arts, martial arts and healing arts] to emphasize specific and unique feelings and sensations. Thus, Nia approaches choreography from an energetic point of view; we repeat the same step and pattern, but change the movement form in order to change the energy. This allows us to stay with the same pattern for longer periods of time, giving both teacher and student time to deepen their connection to body sensations and form. When choreography stays simple, people can feel and express themselves more playfully [and, I would add, in a more healthy and integrated way]. For the official scoop on all nine movement forms, click here. The first part of Principle 2 is Natural Time. Which I’m sure you know about since you read about it, right? As you know, then, the 13-moon calendar is based on a 13:20 code that recognizes the natural cycles of the Universe. Which sounds a bit woo-woo and highfalutin but actually, 13:20 is right there in your bones: the human body has 13 major joints and 20 digits. The second part of Principle 2 is a natural extension of the first. Part 2 of Principle 2 addresses how Nia trains, conditions, and heals this 13:20 body using the energy and essence of the nine movement forms. In a Nia class, we can do any movement in these different ways, each affecting the body differently. For example, a front kick executed with Tae Kwon Do energy is going to emphasize strength, power and stability, while the same front kick executed with Alexander Technique will focus on lift through the crown of the head, length in the spine and an graceful, easeful alignment. As we practice, any movement can be infused with the energy of any of the nine movement forms which offers both teacher and student enormous freedom within the form. This is all excellent and juicy-good, but even if you’ve never done Nia, you can use the energy and essence of the nine movement forms in anything you do. We all have our style and habits around how we approach the world. Take a look at the descriptions of the movement forms (or even better, move them), and you will notice that some come easily and feel familiar and others feel awkward and strange. Notice which movement forms you tend to gravitate toward and then explore the ones that are outside your habit. By exploring all nine of movement forms we have access to a broader range of options for approaching anything. Especially if my habitual way isn’t working, the nine movement forms give me options for another approach. Me? I tend toward Jazz and Tae Kwon Do. The energy and power of these two movement forms is great for some things but in lots of situations and relationships, they work about as well as wearing a red sequined dress to a funeral. For example, if I have a daunting pile of work to do around the house, instead of powering through it Tae Kwon Do style, I can choose to take the Tai Chi approach of mindful, relaxed grace or use the creative possibilities of Modern Dance. When I’m talking to my step-kids, instead of being my Jazzy expressive self, I might choose a Feldenkrais approach by slowing down and reconnecting or tap into the harmonious, circular flow of Aikido. There are lots of ways to move through the world. The nine movement forms give us more options to explore what energy might serve each situation, each relationship, each moment best.